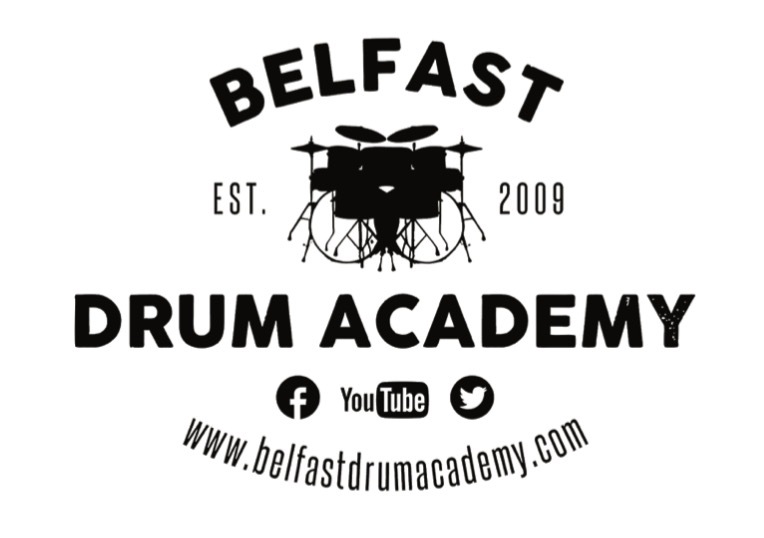 Want to be able to play drum beats and fills from standard drum notation? You need to learn the art of reading sheet music. Let’s start by reviewing the different symbols used to indicate the various elements of the drum set. The hi-hats are marked just above the top line of the measure with a simple “x” symbol. The image below shows four hi-hat strokes. These are to be played with a drumstick while the hi-hats are closed the entire time (using your left foot on the hi-hats pedal). You can also play the hi-hats with the foot alone. In other words, instead of hitting them with a drumstick – you use your foot to open and close the hi-hats. This is marked on sheet music with the following “x” symbols below the last line of the measure. The ride cymbal is similar to the hi-hats in that it is often used in drum beats as a method of keeping steady time. In fact, most all beginner-to-intermediate rock beats have steady strokes on either the hi-hats or the ride. So, with that in mind – you’ll notice that the ride also uses an “x” symbol for drum notation. Above you can see that the ride cymbal is actually played on an imaginary line above the measure. The small line segments in the middle of the “x” make the symbol look like a star, but mentally you should see this as an “x” sitting on a line. These stokes would be played with a drumstick on the “bow” of the ride cymbal. This is the part between the edge and the bell – the largest surface. While some heavy rock tunes may require you to crash the ride cymbal (by playing the edge) – you will find that it typically sounds better to play the bow. The snare drum is the most important part of any drum set. It is a vital part of virtually any drum beat, and is the foundation of the rock back-beat. Here is how drum sheet music indicates a regular snare drum stroke (played with a stick hitting the middle of the drum). As you can see, the snare drum is marked with a simple note on the middle line of the staff. Some books will put this in the second space, but this simpler system makes it easier to differentiate the snare drum from other tom toms (as you will soon see). For now, just keep in mind that the snare drum is in on the middle line. The snare can also be played using cross-sticking. This technique will be explained in a future lesson, but here is how it is indicated in drum notation. This is the last of the drum symbols that uses an “x”, and unlike the hi-hats or ride cymbal notation – it is circled. The bass drum is played with the right foot on the bass drum pedal. Here is how four strokes are displayed on drum sheet music. Like the snare drum, this notation shows a simple note. However, the position is in the bottom space of the measure. That is what indicates this note is to be played with on the bass drum. Some drum sets include two bass drums, or double pedals that allow for both feet to operate the same bass drum. In either case, drum notation has a way of indicating a note that is to be played with the “left” foot on a second bass drum pedal. As you can see, this second bass drum cymbal is on an imaginary line below the measure. It may seem a little confusion, but don’t worry – this is very rarely seen in beginner to intermediate drum lesson material. By the time you need to use it – reading most drum sheet music will be second nature to you. Playing the toms is probably the most difficult part of drum notation to sight read. However, once you understand the three simple symbols, you will be well on your way to developing this important ability. The smallest tom (aka “hi-tom”) is indicated with this symbol. All the tom toms are to be played with a drumstick hitting the center of the drumhead. This produces the clearest tone from the drum, and with practice, will ensure you don’t hit the rim of the drum. The second tom (aka “mid-tom”) is marked with the same note, but in the second gap. And finally, the last tom (aka “low-tom”) is indicated with a note in the third gap. Remember, the snare is on the middle line, and then ALL toms are in gaps between lines. This is what makes it easier to differentiate between playing the snare or toms. Keep that in mind when playing fills, and you will have a much easier time sight reading.